Something else they didn’t tell you about when you were learning all about France in French IV in high school: they cut up beef, lamb, and pork here differently than they do in North America. So today, a quick overview of some of the major differences or at least some guidance in getting dinner on the table. For starters, be prepared for the fact that French and North American beef taste different. How’s that? French cattle are primarily grass fed and thus the meat is less marbled. Moreover, there is not as much emphasis on aging meat. As a result, French beef tends to be less tender than American. Food additives (such as antibiotics) are not used at all. So be forewarned, your tried and true dishes will not taste the same, no matter what you do. Moreover, you need to be particularly careful if you like your meat well-done. Because they are less tender, well-done meats are likely to be quite dry. The laws for labeling are extremely strict and you can learn a lot about your meat, even before you put it in your supermarket cart. Charolais, Salers, Blonde d’Aquitaine, Aubrac, Gasconne, and Limousine are all breeds of French cattle and are considered to be the meats of highest quality. These meats will be labeled as well as race à viande, that is, cattle raised for beef. As you can see, there are twice as many French cuts as there are American. But do not despair. Here are a couple of short cut definitions. If you are looking for a New York strip, choose a faux filet or Coeur d’Aloyau For rib-eye, try an entrecote. For sirloin, a rumsteak will generally do the trick. If you are making beef stew, look for paleron, macreuse, gite, or jumeau. There are fewer cuts of pork. If you are a fan of pork tenderloin, look for filet de mignon de porc. Beware of bacon; it is more like what Americans call Canadian bacon than the crispy strips you’re used to having with eggs at breakfast. Poitrine is the best substitute although it’s probably not exactly what you want. Lardons in both nature (plain) or fumé (smoked) are bits of bacon sold packaged; these are good in quiches and any other dish calling for crumbled bacon. For a diagram of French pork cuts, check out this page on the French pork producers site. If you’re ever in doubt, the best thing to do is to go to the butcher shop and ask the butcher’s opinion about the type of meat most suited to the dish you are making. You will pay a premium by shopping at the boucherie but in general, the product will be superior. If your budget doesn’t permit regular shopping at the butcher, don’t be embarrassed to go every now and again and in between, apply the knowledge you gain to your supermarket shopping. 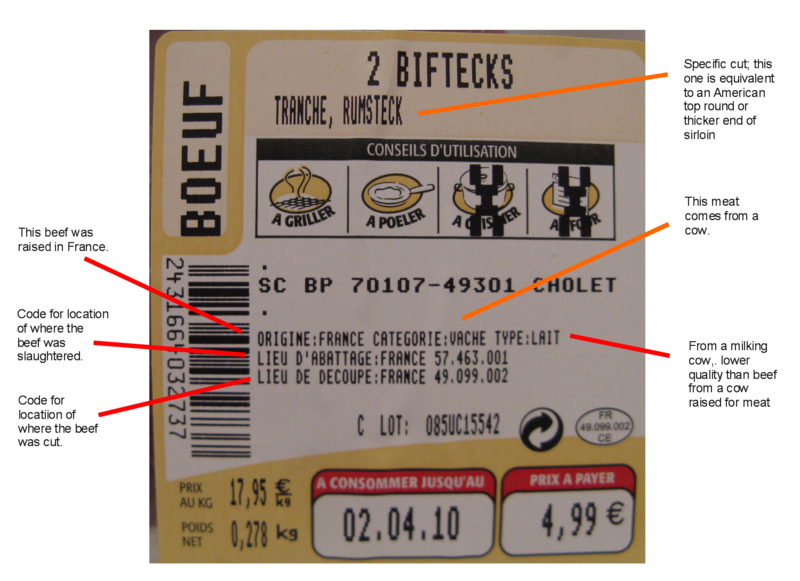 Les morceaux de boeuf: From a French cattle industry group (and thus all in French), this site offers an interactive feature if you scroll down the page until you see the diagram of the cow. Click on a portion and you will get a photograph of the cut, its name, and suggestions for cooking. This entry was posted in Cooking and Baking, Food Shopping and tagged bacon, beef, cuts of meat, filet mignon de porc, food labeling, France, grass fed, lardons, Paris, pork, steaks. Bookmark the permalink. Great tips on the meat, and so true about the taste and texture of French vs. US beef. I’ve been wanting to find charts like these forever. Would love to find one for porc, too. Thank you so much for this article. I have lived in Bourgogne for 9 years, and still did not know cuts of beef well. I knew what I wanted for Boeuf Bourgogne, or a few other dishes, but was never sure what to get for a roast. Excellent post on the cuts. It is very good to see an actual parisian beef price. My input on the beef differences. French beef is different to US beef in many ways. Firstly, you’re likely to be eating a culled cow of 4-10 years. That is way older than any US beef. US beef is usually under 2 years of age. In the US, culled cows make hamburger meat. In the US when you get a steak you will likely be getting a steer (castrated male) but in France you will get a fattened retired mother cow. The male calves in France usually go to feedlots in Italy and Spain. They are the premium product. The word ‘boeuf’ means a steer when you say ‘un boeuf’, but you aren’t likely to be eating one in Paris unless your butcher has a special (and expensive) deal with a farmer. US beef is also mostly feedlot beef where the young animals spend some months in a facility where they are fattened up in large numbers. France has its feedlots up north where you Parisians are. I’m not sure of the percentages but there’s less feedlot beef here than in the USA. As you point out, a lot of beef is retired dairy cow. THe number I have read is 60%. I wouldn’t say it is lower quality offhand, since I think a Normande gives a better steak than the big three beef races (Charolais, Limousine, Blonde), but each to their own taste. French beef will on average eat more grass than an American feedlot cow but those dairy girls could be eating fancy pellet rations and they will all be grain finished rather than grass finished. The big difference in marbling comes from the races of the cows. It would be a miracle to get a US Choice or Prime rating from a Limousine, Blonde or Charolais. They’re just not bred for it. As you say, talk to your butcher and they’ll know what they can get. Best of luck finding good steak!